At least ten people were robbed in eight separate attacks across our area over the holiday weekend, including three robberies at gunpoint on the 4th of July. Area North detectives are preparing a community alert to raise awareness of one emerging pattern, according to a source. One man—recently paroled for robbing a neighborhood Quiznos in 2012—is facing three charges of aggravated robbery after he tried to pull off a series of hold-ups on Sheffield between Barry and Belmont early Saturday. All of the details on that idiot are posted HERE. Elsewhere, detectives have linked several similar armed robberies that have been recently reported in Lincoln Park and nearby Lakeview. In the latest hold-up, a woman was pushed to the ground and mugged in front of an open-for-business Starbucks at Lincoln and Greenview around 6:30AM Monday. The victim told police that a man jumped from the back seat of an older white car, tackled her, and then pulled out a gun when she struggled. He then fled with her iPad. According to witnesses, the offender is a black man, about 6-feet tall, with short black hair. He got back into the vehicle, which fled southbound on Lincoln. • Around 3:15AM Monday, a woman and her friend were robbed at gunpoint by two men near Belden and Geneva Terrace in nearby Lincoln Park. The victims told police that two black men wearing all black clothing and hoodies over their faces produced a handgun and took a purse, an iPhone, cash, and jewelry. Both men were about 6-feet tall, the victims said. • Just before 1AM Monday, a man reported being robbed at gunpoint by two black men with covered faces near Wolfram and Southport. Police were unable to find the man when they arrived. • Around 3:15AM on Friday, a woman reported being robbed at gunpoint in the 3900 block of N. Southport by two men who followed her from the Sheridan Red Line station. She described the men as black, 18- to 19-years-old, 5’8” tall, wearing all black clothing. • Witnesses reported seeing a man get pepper-sprayed and robbed in the 3700 block of N. Racine around 6AM on Sunday. The offender—possibly a woman—is black and wore a black mini-skirt. Police said the victim was not particularly helpful in getting details about his encounter with the suspect. He was treated at Illinois Masonic Medical Center and released. • A woman reported being robbed at knifepoint by two men in the 4400 block of N. Malden around 3PM last Monday. The victim said a white man and a black man confronted her with a knife and took her cellphone before they fled eastbound on Montrose. Both suspects were wearing sunglasses, the woman said. • A man reported being jumped and mugged by “a bunch of black males and females” outside of 1000 Liquors, 1000 W. Belmont, at 5 o’clock last Sunday morning according to an officer who was flagged down to take the man's report. Case #HZ323902 was filed. 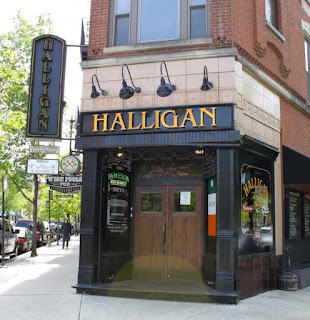 • The manager of a restaurant in the 1200 block of W. Fullerton was stabbed in the arm and robbed around 9:45AM on June 21. The victim told us that he was on his way to the bank when the offender pushed him back into the store and robbed him at knifepoint. He described the suspect as male, black, 5’10” tall 150 pounds, and wearing all black clothing. • At 3PM the next day, two men who asked to use the restroom at Halligan Bar, 2274 N. Lincoln, wound up robbing the joint instead. Both offenders were last seen running northbound on Lincoln with the contents of the tavern’s cash register. They are described as male, black, 18- to 20-years-old, 5’9” tall and wearing black sweatshirts and baseball caps.